Initiated in 1999 there was an idea to produce an official series of six legal tender Millennial coins for a Commonwealth country, like the Solomon Islands or Zambia, which would feature the six monarchs of the twentieth century; Victoria, Edward VII, George V, Edward VIII, George VI and Elizabeth II. British sculptor Donald R. Golder completed the task of sculpting twenty Royal portraits, which were inspired by contemporary coinage models. The envisaged six-coin series never came to fruition, but two of Golder's royal portraits were eventually featured on the 2001 Zambia coinage set which commemorates the death of Victoria and the accession of Edward VII in 1901. A parallel series of modern high quality unofficial "retrospective patterns" for Great Britain, Australia, Canada, Cyprus, Hong Kong, Ireland, Isle of Man, Jersey, New Zealand, South Africa, and Southern Rhodesia have been produced using all of Golder's modern obverse portraits, coupled with modern reverses which are based on old designs. All the unofficial pieces have therefore been struck in the years 2000-2001. A.G. Wyon's original model for the reverse of the 1910 pattern crown, has been used to inspire some unofficial "pattern crowns" for George V and Edward VII. William Wyon's 'Three Graces' design, personifying Ireland, England and Scotland, has been the inspiration for a quantity of modern Victorian "patterns". There is a modern 'wreath crown' of Edward VIII featuring a new version of Kruger Gray's popular reverse motif and several modern "patterns" for Ireland, which emulate those of Reginald Huth. Altogether there are 174 unique modern gold strikings made with more than 50 (cancelled) original dies, lead impressions, etc. There are several thousand pieces in proof (.925) silver, copper and golden alloy (a metal akin to goloid used in the production of many US patterns) of the various types; all modern and struck in the year 2000. Edward VII, unofficial "Pattern Double Florin" or "Model Four Shillings" dated 1910, "colonial" crowned and bust right, DRG below, by Donald R Golder after A G Wyon, EDWARDVS VII D: G: BRITT: OMN: REX F: D: IND: IMP., rev. inverted, crowned Arms of Jersey, date either side, within quatrefoil, denomination below, STATES OF JERSEY above, edge milled, diameter 36mm. A total of 360 sets of silver, copper, and the golden alloy were issued. Edward VII, unofficial "Pattern Double Florin" or "Model Four Shillings" dated 1910, bare head bust right, DRG below, by Donald R Golder after A G Wyon, EDWARDVS VII DEI GRATIA INDIAE IMPERATOR, rev. inverted, crowned Arms of Jersey, date either side, within quatrefoil, denomination below, STATES OF JERSEY above, edge milled, diameter 36mm. 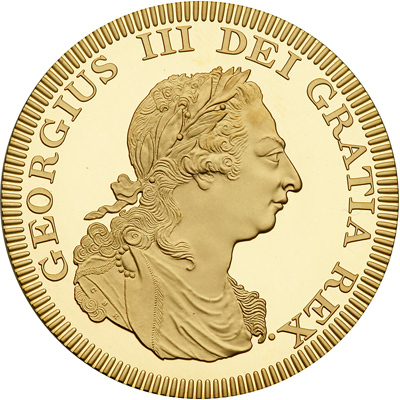 Only two gold patterns were minted, one with the reverse inverted and the other en medalille. George V, unofficial "Pattern Double Florin" or "Model Four Shillings" dated 1910, bare head bust left, DRG below, by Donald R Golder after A G Wyon, GEORGIVS V DEI GRATIA INDIAE IMPERATOR, rev. inverted, crowned Arms of Jersey, date either side, within quatrefoil, denomination below, STATES OF JERSEY above, edge milled, diameter 36mm. A total of 360 sets silver, copper, and the golden alloy were issued. Edward VIII, unofficial "Pattern Double Florin" or "Model Four Shillings" dated 1937, bare head bust left, DRG below, by Donald R Golder after H Paget, EDWARDVS VIII D:G: REX IND:IMP, rev. 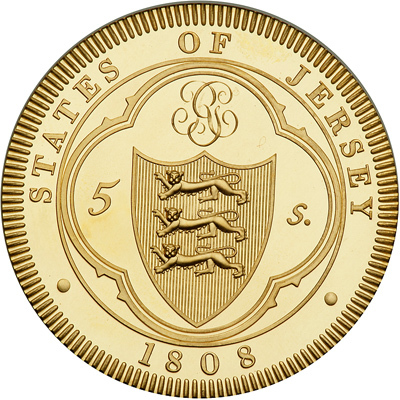 inverted, crowned Arms of Jersey, date either side, within quatrefoil, denomination below, STATES OF JERSEY above, edge milled, diameter 36mm. A total of 260 sets silver, copper, and the golden alloy were issued. Edward VIII, unofficial "Pattern Double Florin" or "Model Four Shillings" dated 1937, "colonial" crowned and robed bust left, DRG below, by Donald R Golder, EDWARDVS VIII D:G: REX IND:IMP, rev. inverted, crowned Arms of Jersey, date either side, within quatrefoil, denomination below, STATES OF JERSEY above, edge milled, diameter 36mm. A total of 360 sets silver, copper, and the golden alloy were issued. George VI, unofficial "Pattern Double Florin" or "Model Four Shillings" dated 1937, bare head bust left, DRG below, by Donald R Golder after H Paget, GEORGIVS VI DEI GRATIA INDIAE IMPERATOR, rev. inverted, crowned Arms of Jersey, date either side, within quatrefoil, denomination below, STATES OF JERSEY above, edge milled, diameter 36mm. A total of 360 sets silver, copper, and the golden alloy were issued. Examples of lead impressions for these patterns. This is a gold pattern five shillings, 1808. George III. Obverse: Draped laureate bust of king facing right by C.H. Kuchler. Initials C H K on shoulder. Legend reads: GEORGIUS III DEI GRATIA REX. Reverse: Shield of Jersey. Denomination and date. Weight 46.75 grams. proof struck in .916 (22 carat) gold. Reverse en medalille (upright). UNIQUE. This privately minted 'retro' pattern is one of a series of 12 and was inspired by the work of the numismatist W J Taylor who in the mid 1800s produced a series of coins using Kuchler's spectacular portrait of King George III. Other metal proofs include silver, copper, bronzed copper, aluminum, golden alloy, pewter and nickel silver.